Sometimes we could all use a drink. I’m not talking about a water because we’re thirsty kind of drink, either. No, I’m talking about alcohol, people. Booze. The hard stuff. Liquor. Yea, we could all really use a drink every now and then. Especially after a long day of work, but not necessarily only on those days. Sometimes we’re not all that tired or stressed out, but we still want a drink anyhow. That’s okay. I’m here to tell you that’s okay. As a matter of fact, grab yourself a drink right now. And even if you don’t drink, well then pour yourself some juice and pretend it’s a stiff drink, because you’re tired and because you need it and because you deserve it. There are some days where I’m just staring at my watch, counting down the minutes to five o’clock—because I don’t know about you but I feel much better drinking once it’s officially the evening. I’ll be honest with you, though, many times, I don’t even make it to five. I can’t bear all the waiting so I just start drinking early on. Don’t worry, I’m not an alcoholic. I just go through these phases where I need a drink, and if I don’t get one, I fly off the rails and go crazy. I have it under control though. I don’t have a problem. (I’m totally kidding mom). This is for all the people out there that love a good drink but don’t need it to be super strong. It’s a drink for those who like lounging in the backyard or by the pool enjoying the sun and the start of spring. For those of you still experiencing tons of wet, cold, snowy weather, well then, this one is for you as well. Make a big batch of this stuff and close your eyes imagining that snow isn’t there anymore. I’ve got you covered. 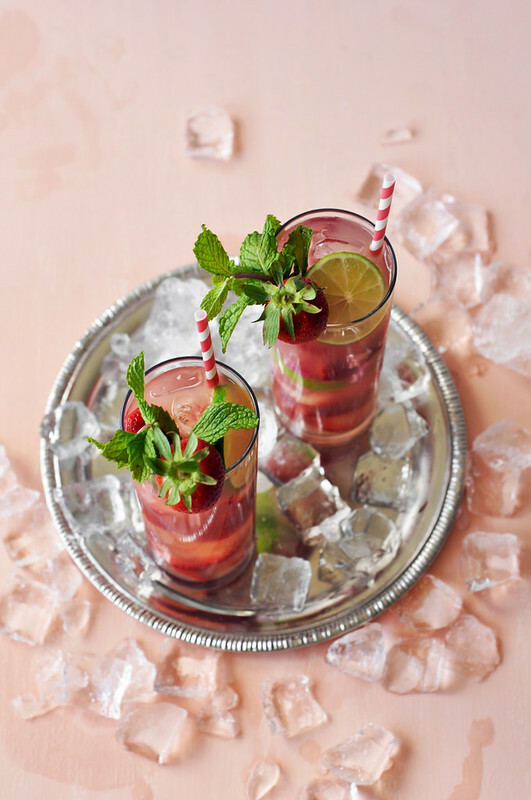 Sangria is typically made with red wine which is how the name sangria got placed onto it because it has something to do with it looking like the color of blood…or something along those lines. I can’t really remember what I read about it. Perhaps I was drinking at the time. Anyhow, I’m not much of a fan of red wine so I wanted to make a white wine sangria. 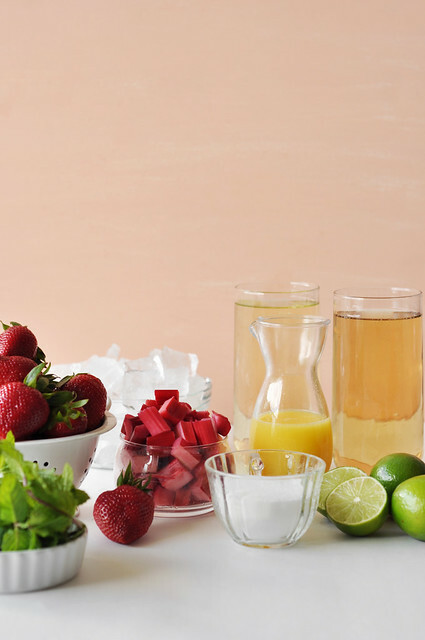 With white wine, which I guess makes sense, and since I’ve been in a strawberry rhubarb kick lately, I thought to myself, “Self, why not make a strawberry rhubarb sangria? That sounds delicious!” And what do you know? It was delicious. I should listen to myself more often. Right now I’m telling myself I could use a couple glasses of strawberry rhubarb sangria, excuse me.